Picturesque, west facing ocean views & sophisticated design elements offer an oasis of serenity, beauty & uplifting natural light in this stunning single story home! Highlights include gated community, corner lot, tranquil courtyard entry, travertine tile & wood floors, designer wallpaper & paint, gorgeous remodeled kitchen w/ marble counters, private master suite w/ peak ocean views, spa-like bath, walk-in closet & loft space, new landscape/hardscape throughout & more! See supplement for so much more!! !, Picturesque, west facing ocean views and sophisticated design elements offer an oasis of serenity, beauty, and uplifting natural light in this stunning single story home! Freshly designed, tranquil courtyard entry welcomes you into the highly sought-after, open single story floor plan featuring a gorgeous formal living and dining room, generously sized upgraded kitchen that overlooks family room, spacious secondary bedrooms, and private master retreat displaying peak ocean views, ensuite upgraded spa-like bathroom, walk-in closet with custom built-ins, and upstairs loft space. Highlights include crown molding, Italian travertine tile and hardwood flooring, designer wallpaper and paint, chef styled kitchen with marble countertops and custom tile backsplash, custom lighting, plantation shutters, new sprinklers with drip system, epoxy flooring and shelving in garage and much more! Desirable corner lot creates the ideal setting for relaxing, entertaining or building the pool of your dreams! Backyard has been recently remodeled including new hardscape raised patio to enjoy views, custom built-in outdoor grill area, artificial turf and low maintenance, lush landscaping throughout. 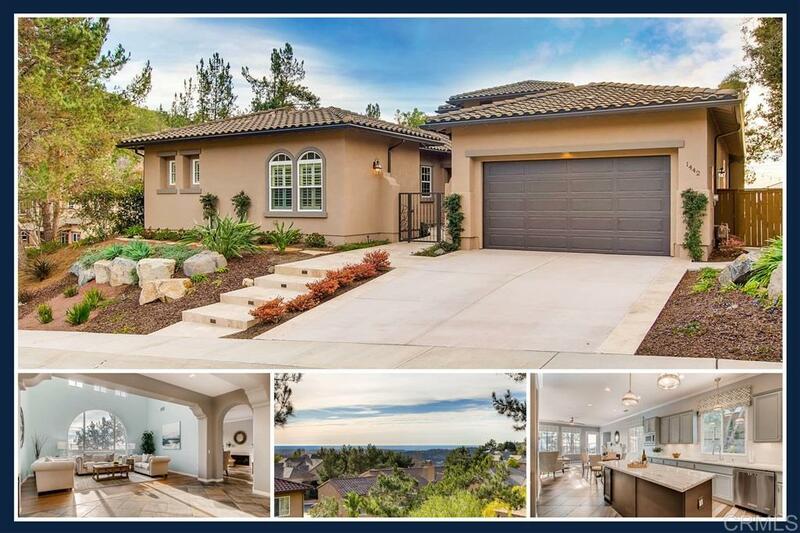 Ideally located in the lovely gated community of WestCliffe, close distance to award winning schools, trails, parks, shops, and the amazing amenities of San Elijo Hills.